Women in Worship Live: Vineyard Music EXTRA! In addition to the many conferences hosted worldwide by Vineyard Music Group, &147;Women in Worship Conferences train, equip and inspire women in worship and are a vital part of the overall vision of VMG. &147;Women in Worship Live was birthed from the desire to encourage and ignite women in worship. This captivating release contains a collection of female-led worship recordings from Vineyard events around the world. The heart of this release is to capture the special gift that women bring to the Lord and to the church; intimate expressions of worship filled with tenderness and love. Featuring: Cindy Reithmeier (author of Exalt The Lord), Rita Springer (author of Make Us A Prayer), Rae-Helen Fisenden (Australian worship leader featured on Winds of Worship 11) and Wendy Whitehead (U.K. worship leader featured on Winds of Worship 12), Loralee Thiessen and Marie Barnett. 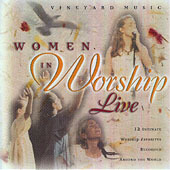 The women featured on this release all represent Vineyards heart for women in worship. Each woman is involved in leading worship in their local church. Many are also prolific songwriters and teachers who hope to be living examples of worship. &147;Women in Worship Live will be a wonderful addition for any woman seeking to grow in worship. Songs include: Who Is This, Simply Said, Make Us A Prayer, We Will Bow, I Love You, Oh Lord, I Bow Down/Jesus Loves Me, When Its All Said And Done, Breathe, I Receive, More Love, More Power, Alleluia, He Is Coming, Jesus Is Coming Again.